All-natural, handcrafted soaps enveloped in soft felt. Dimensions: 3.5" D x 2"
Smells good. Don’t need wash cloth. Love it. And it looks pretty just sitting there. Smells nice. Love the way it looks. Soap is not exactly a new invention. 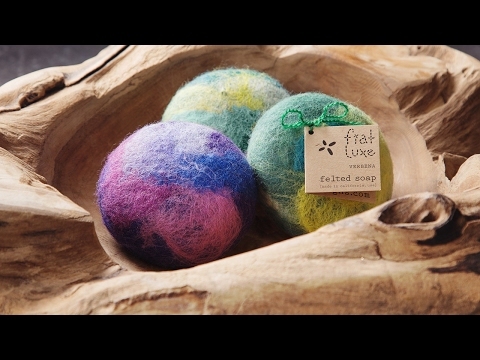 But felted soap—now that’s something you’ve probably never heard of before. 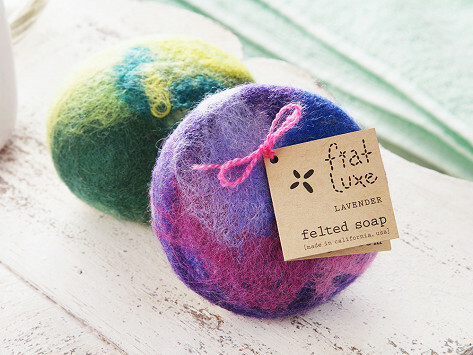 Like a soap and washcloth all in one, Fiat Luxe is wrapped in colorful wool felt for a lovely marbled look and gentle exfoliating feel. The soap is handmade in the USA using only natural ingredients and generously scented with botanically derived essential oils for a lovely aroma from the first wash to the last. The soft wool felt is domestically sourced and has naturally occurring anti-fungal properties. The felt shrinks along with the soap as you use it and will retain its freshness as long as you give it a quick squeeze to remove excess water. Once the soap inside is gone, you can make a small slit in the felt and re-stuff it with odds and ends from other bars. Nancy Rosenthal of Santa Rosa, California came up with the idea for Fiat Luxe while making soap as a gift for family and friends. In the process of cutting the soap, she found herself with leftovers of different shapes and sizes. Never one to waste, Nancy formed the remaining pieces into patties and encased them in felt. A fragrant addition to any bath, decorative basket, or potpourri sachet, Fiat Luxe is a beautiful new way to soap up.